Here is my first "it's too hot to cook" post of the summer! Over the summer I still do a lot of cooking in the house, but most of our proteins and even veggies are made on the grill. And then there are some nights when I don't even want to turn the stove on at all and I crave light and healthy meals. This Vietnamese pork and cold noodle salad is light and refreshing - perfect for a hot summer night. Besides not wanting to stand over a stove, I was inspired to make this dish because of my desire to use 2 specific ingredients - the pork chops I picked up as well as a package of rice vermicelli noodles my dad had recently brought me from a day trip to Philadelphia's Chinatown. 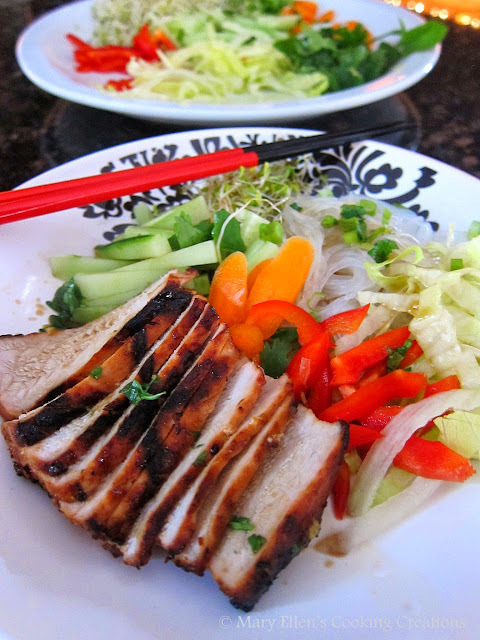 I came across a recipe on the Food and Wine web site for Lemongrass Barbecued Pork with Rice Vermicelli Salad. 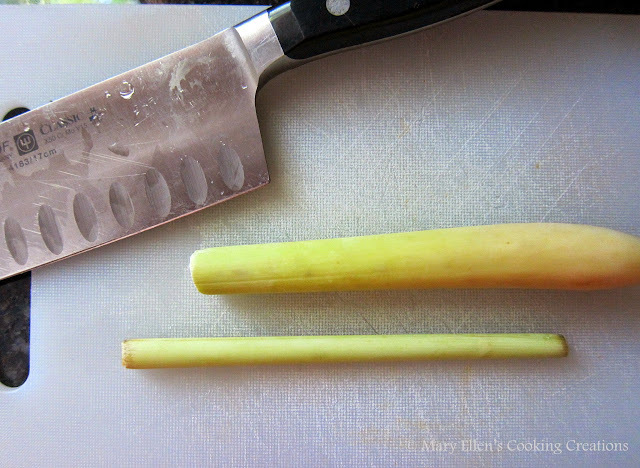 I never used lemongrass in my own cooking before - I have only enjoyed it in restaurants. As soon as I cut of one end my entire kitchen was filled with the best lemony aroma ever - I knew this was going to be a good marinade! 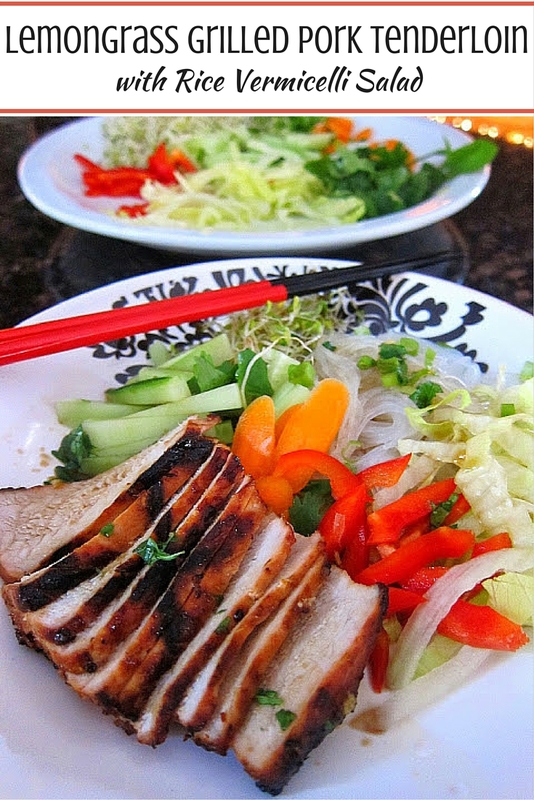 The pork marinated in this lemongrass mixture for several hours before grilling. The sauce/dressing starting by making a paste of jalapenos and garlic followed by some cilantro and lime juice. Bright yet spicy! The original recipe called for only noodles, carrots and cucumbers in the salad. I added a few ingredients to make this more of a salad that reminded me of these Vietnamese spring rolls. This really turned out to be the perfect summer meal. It was satisfying and filling yet healthy. Simple yet packed with so many flavors. Bright and refreshing yet spicy. I'll definitely make this one again - soon! I made several small changes to the recipe noted below in italics. In a food processor, finely chop the garlic, lemongrass and shallots. Add the sugar, fish sauce (or substitution), lime juice, vegetable oil and soy sauce and process to a paste. In a large shallow dish, coat the pork with the marinade. Cover and refrigerate for at least 1 hour (I marinated this for 5 hours). About 30 minutes before you plan to eat: In a large bowl, cover the rice vermicelli with cold water and let soak until pliable, about 20 minutes. In the meantime, bring a pot of water to a boil (the only time you will need your stove!) Bring a large saucepan of water to a boil over high heat. Drain the rice vermicelli and add it to the boiling water. Cook, stirring, until barely tender, about 1 minute. Drain the vermicelli. Rinse the vermicelli in cold water and drain thoroughly. 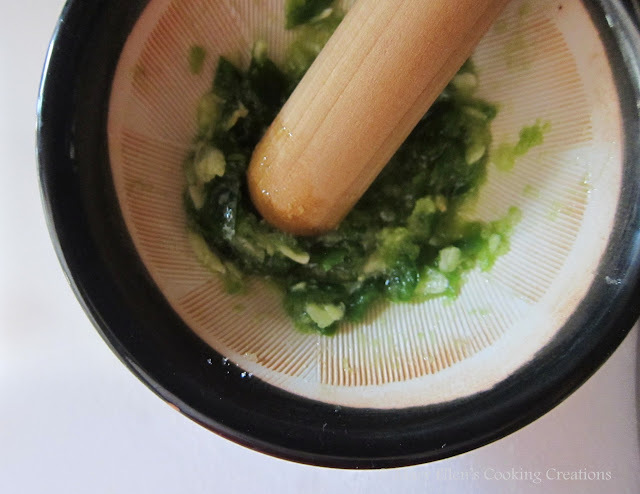 Make the dressing: In a mortar, using a pestle, pound the garlic cloves to a paste with the chiles and sugar. Stir in the fish sauce, cilantro, mint, lime juice and water. Grill the pork: Light a grill (heat to medium high). Lift the pork from the marinade, leaving on some of the flavorings. Grill the pork over a hot fire until nicely charred, about 2 minutes per side. Because we grilled a tenderloin instead of slices, we used Jon's tried and true method for grilling pork - sear on all sides over high heat; place foil on the grill, put pork on the foil, and let it cook over medium heat until temp reaches 150 degrees max; remove from the grill and let rest 5 minutes before slicing. 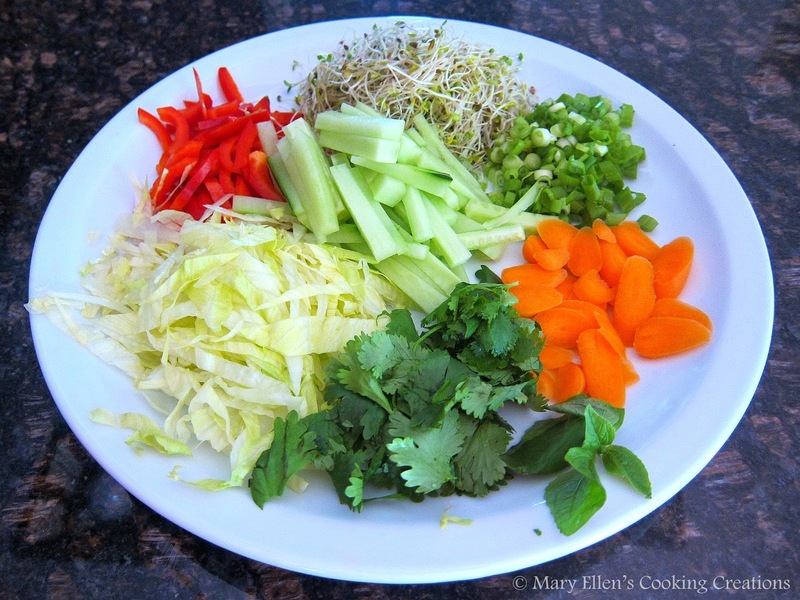 Plate everything: place noodles on your plate and add veggies; top with some of the dressing. Slice the pork into thin slices and place over the salad. Oh my goodness, this looks amazing. I love the aroma from lemongrass! Yum! I love those vermicelli noodles, I stock up any time I'm in the Asian grocery store.